So, you've decided you want a swimming pool, but you're not quite sure how to go about actually getting one? This guide will give you some basics on things to know up front and tips to help ensure your pool buying experience goes swimmingly. There are a lot of things to look at, and taking the time to consider them now can help out a lot in the long run. For example, you don't want to purchase a swimming pool kit, only to find out local codes, or the space you have will not allow you to install that size pool in your yard. We'll help make sure you're buying with confidence, starting now. First things first... Do you need a permit to build a swimming pool? Some cities and townships require a permit to build a pool. If you live in one of these areas, start with contacting your local code enforcement for a list of requirements. These can include plumbing requirements for wastewater, and electrical permits that dictate a dedicated pool GFCI outlet be installed, along with proper pool bonding. If you do need a permit, and you find out you need additional documentation other than just pool size, contact our team at 866-532-8194, and one of our sales consultants will assist you in obtaining the necessary documents that we can provide. If you do not need a permit, please feel free to do a little happy dance and continue reading. One of the first questions you need to ask, is where will your new pool be going? This will help find answers to other questions such as what size pool can I get, what shape, etc.. The easiest way to do this, is to determine how much space you have available for a pool. Check local code requirements to determine if there are any restrictions on how close you can place your pool to property lines, fences, your house, or other standing structures. You will also need to check for any overhead power lines, and make sure you clear those by at least ten feet, or however far your local code requires. If you do not have local code enforcement rules to follow, a common practice is to stay five feet away from any standing structures, including fencing and from the property lines. You can mark these areas with spray-painted dotted lines or small construction flags (available at most hardware stores). You will also want to check for underground power lines, plumbing, cable lines, etc.. You can do this by calling 811 from any phone. Utility operators will come out and mark any lines in your yard for free. More info on this can be found here. With any and all areas that will cause interference in your pool install marked, we now know where the pool can go. Measure the area in either a square or rectangle and decide if you would prefer a round or an oval pool. Keep in mind, some yards won't allow for a very large round pool, or simply aren't long or wide enough for an oval pool. BONUS TIP: There are also elevation changes to consider. If you have a slope on the back half of your yard, to simplify installation, you may want to keep the pool up on the hill if the slope goes downwards, or keep from cutting into the hill if it goes upwards. Typically, an above ground pool install is done so in the flattest area possible to minimize digging, and prep time. However, a semi-inground pool may be the ticket to solving this issue altogether since they can be built into a sloping yard. With all this considered, you now know what size and shape pool will fit. Now that you know how much space you can use, decide how much you want to use, and what size and shape pool works best. If you have a large elevation change, or just want to recess the pool into the ground more than 18", be sure to shop for semi in-ground pools. These are typically just stronger above ground pools, sometimes using special backfill procedures. Now you're all set! You have your size picked out, you know the shape you want, and you start searching... and now there are many different models to choose from and at many different prices. The good news is that the most expensive pool is not always the best for your yard, much less your budget. 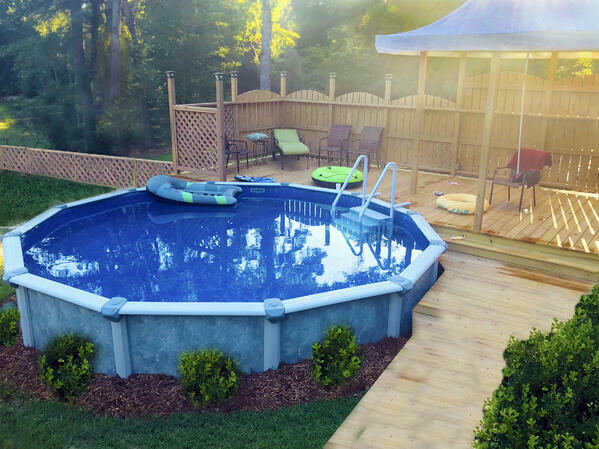 There are a lot of good-looking and long-lasting pools available at reasonable prices. Here's what you need to know: Material, wall height, and brand are just a few things that can affect the price. 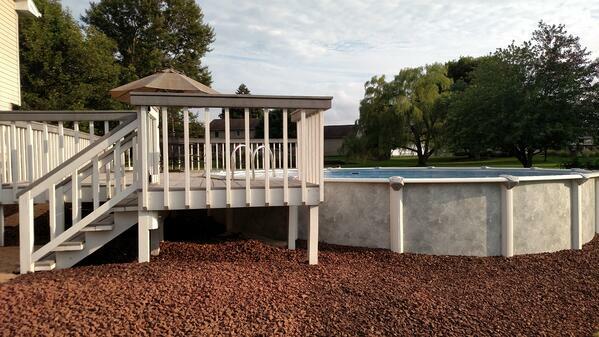 Some pools have larger bracing, and resin pools are typically more expensive. A good thing to consider first is how long you want to have the pool for. If you're thinking 5-10 years or so, pretty much anything out there will work. 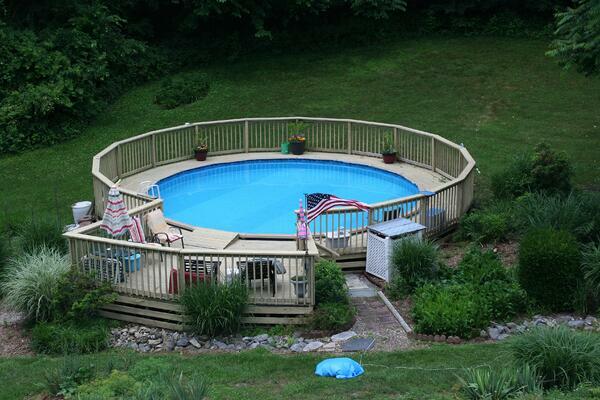 If you're planning for a longer time frame, consider some of the pools with longer warranties. The warranties are prorated in the pool industry and aren't necessarily an indication of exactly how long the pools will last, but they will give you an idea on to the quality of the pool. 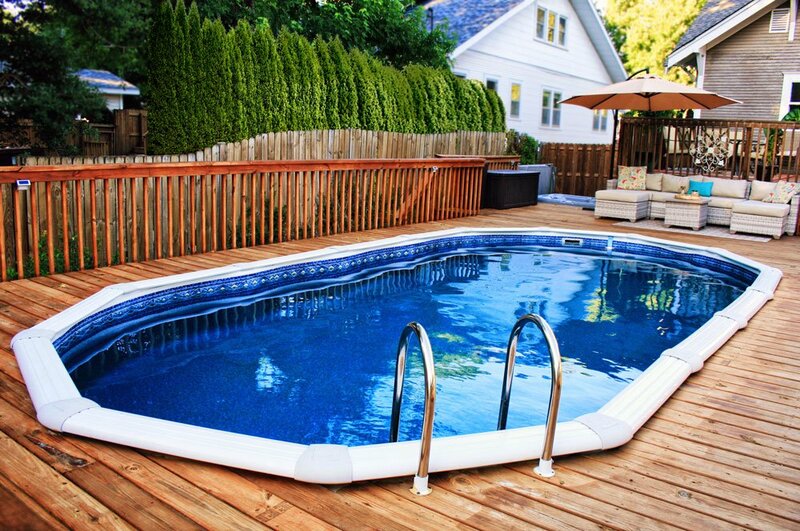 A longer warranty typically means the pool should last longer if properly taken care of. BONUS TIP: Most above ground pools install basically the same way, so from one model to the other, if you can build one, you can build them all. Thankfully, there isn't much to consider here for normal installations. Visit our website and pick which model fits all of your needs and wants, then select which size you determined works best. Have it picked out? Great! We're almost done. This hasn't been terribly difficult, and now we know exactly which pool model and size we want! Now, for the fun, but tricky part. You've made your way from the model and size page to the kit building section. Time to build a kit! Pools need equipment to operate, and there are a lot of options to choose from. 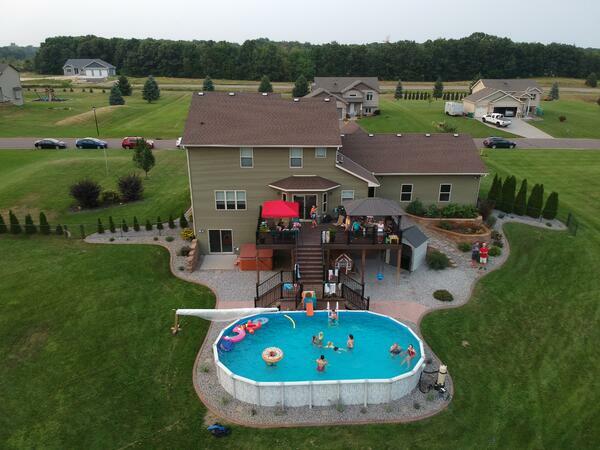 You'll want to decide what kind of pump and filter system you want to use, the liner pattern and mounting, and of course any accessories that will make pool ownership easier. Automatic cleaners, chlorinators, salt systems, etc. all make pool ownership easier. Also, something as simple as adding a timer to your pump can cut your electrical usage in half or more. We have another blog written dedicated to helping you choose the equipment and accessories that will be right for you and your budget. That all sounds like a lot, right? When building your kit online, you should see a little "eye" next to most selections, and they are labeled quick view. This is an information link that will open up a small window and explain the item(s) you are currently looking at. Once you have reviewed the items and made your selection, move on to the next part of the kit builder. Take each line one at a time, and in order provided whenever possible. This will help to ensure all of your equipment works together. There are also small switches labeled "Active" This will allow you to activate, or deactivate certain items. For example, if you don't want any of the liner patterns shown on that product page, you can deactivate that section, and add a different liner from another page. Once you have gone over all of the items and made your selections, click the "add to cart" button at the top right of the page. From here, the shopping cart acts much like most other shopping carts you have seen online. However, we do have a feature not found on a lot of other sites towards the bottom that says "request a quote." If you want to save your shopping cart, or you're not quite ready to purchase, or you'd like to make special requests, choose this option. Fill out the form you're taken to and one of our team members will look it over, make any changes you request, and email the updated quote to you. Otherwise, if you are confident you have chosen what best works for you and your budget, and are ready to swim, click "secure checkout". From there, its as simple as filling out your billing and shipping information, and then you're done! Now, just sit back, and wait for the pool to arrive. You'll be swimming before you know it!